The run is now out! Watch it on YouTube. High-quality downloads and other in-detph information can be found here. We’re glad to announce that the long awaited Half-Life: Done Enormously Warped speedrun will premiere this Sunday, on the 15th of July, at 17:00 UTC, live on our Twitch channel! During the stream we will also showcase the main tricks used in the run, and possibly an in-depth commentary by the runners. Get ready, Half-Life in 6 minutes, 26 seconds! Summer of SourceRuns is currently underway, and before we go into the big news, I would like to announce that Half-Life 2 Gravity Gun only speedrun is being premiered this Sunday, July 8th at 17:00 UTC, live on our Twitch channel! Don’t miss it! Meanwhile, we have began organizing the annual SourceRuns Marathon this year, which will take place on August 3rd-5th! We have now opened sign-ups for all runners who are willing to participate in the marathon. Just as before, every GoldSrc & Source game/mod is welcome (and prioritized), but this year we will also be accepting other “non-Valve” games to our repertoire, so do not hesitate to submit them! The sign-up form can be found here. The sign-ups will be open for two weeks, closing on July 21st. After that, we will be contacting the runners and building the schedule for the marathon. Keep an eye for any updates being posted here for more details. If you have any questions feel free to ask them on our forums, or find us on our Discord server! As you might’ve noticed, we’ve migrated our forums software to the new and shiny Discourse! This mainly allows us to integrate the forums better into the site, adding the ability to easily discuss each post over at the forums, while also making it more simple for everyone to jump into discussion due to a more simplistic layout. Go check it out! Since our forums were pretty dead lately, hopefully this will spark up some new discussions. If you have any feedback (suggestions, improvements, bug-reports), let us know! The second SourceRuns Half-Life Jump Map Cup is finished! 🇧🇪 Beginner takes the crown with a 3-1 victory against 🇹🇷 ThereIsNoNeedToRun, congratulations! We want to thank all participants for entering the cup and showing off some incredible skills to us once again. Also, massive props to those who have contributed to the prize pool, raising it to an incredible sum of 500€+, this completely blew away all of our expectations! We hope everyone had a good time and see you next time! After a pretty successful first edition of SourceRuns Half-Life Jump map cup™ we’ve been trying to organize a second one this past year, however due to lack of good organization it never really happened. Until now, that is! The SourceRuns Half-Life Jump map cup is coming back for a 2nd edition in 2018! It will take place in February 3rd, starting at 16:00 UTC. Don’t miss it! Same as last year, it will be a live event that we will stream on our Twitch channel at http://twitch.tv/SourceRuns so make sure to follow that. This time we’ll be introducing some new maps, though a couple of classic ones have remained as well. A package with all the map files is available here. The rules are pretty much the same as last year, with the map picking part being slightly different. The tournament will have a Best of 3 Single Elimination format, with the grand final being Best of 5. Each participant will be able to pick and ban one map out of the pool. During the grand final, each player will only be able to ban one map. All runs are done in a Half-Life multiplayer mod Adrenaline Gamer, on a server running HL KreedZ. The mod has uncapped bunnyhopping and a built-in autojump feature that you will be able to use. Using checkpoints and teleports is not allowed, every run has to be a “Pro” run. Abuse of health boosters to gain speed at the start is not allowed. Tournament runs will be 1v1 races. Any kind of scripted sequences are banned, except OpenAG autojump, duckroll, doubleduck and usespam. agtricks stair climb script is also banned. You are required to record demos during your runs and be able to provide them if requested. We are going to have an open prize pool again, so if you wish, you can donate here. List of players who have signed up so far is available here. An update to Bunnymod XT was released, allowing runners to save the run data (final timer value, gameover event etc.) inside demos. This means that the runners are no longer required to include a screenshot/video together with the runs when submitting them to speedrun.com leaderboards for GoldSrc games. You are now required to use the latest Bunnymod XT version for speedruns. The _bxt_save_runtime_data_in_demos CVAR must be set to 1 (default value). You are no longer required to include a screenshot/video when submitting a run, demos are enough. The SourceRuns Half-Life Jump Map Cup #1 is now over! Congratulations to PJC for winning the grand final, with d0t taking the 2nd place! Both runners showed us some insanely great jumping skills. Big thanks to everyone who has signed up and participated, as well as to the contributors to the prize pool! We hope you enjoyed the show! Brackets can be found here. The first edition of SourceRuns Jump map cup took place in March 11, 2017. The prize pool was raised to 200€, with first prize winner receiving 70% of the prize, and second place 30%. The SourceRuns Marathon 2016 took place in August (12th-13th) with over 35 games ran by the community members, as well as a fundraiser, raising a total of $621 for National Alliance on Mental Illness. A list of all speedrun VODs is available over at the forums. After the success of the 2016 SourceRuns Marathon, and after many requests for more frequent content over the years, we have started hosting “mini-marathons” every 2 weeks on our Twitch channel, featuring runners in and around the community, and featuring more than just Source and GoldSRC games! If you have ever wanted to get involved with SourceRuns, or just want to show off some of your runs, please contact us directly on the forums, Twitter, or on our Discord (discord.gg/sourceruns), and we’ll be happy to include you in one of our events! This is open to all speedrunners from all communities, so don’t be afraid to submit a non-source game, too! Traderain made a program to analyze demos and saves from any source or goldsource engine demo or save to eliminate the need of multiple tools. It’s still in heavy development, but you can try it out here. You are now required to provide run demos when submitting your time to GoldSrc game leaderboards on speedrun.com. We have updated our “Getting Started” guide to help you set up the game for this rule. A new version of Bunnymod XT has been released, adding lots of new useful features. Make sure to update. Alien Swarm Timescale Assisted Speedrun by Onin is out! Watch it here. PJC has uploaded a new run of Half-Life: Decay “Surface Call” chapter, beating the old time from the 19 minute speedrun by 5 seconds. BitRain has recorded two explanation videos for the Half-Life 2: Done Quicker speedrun, covering both Train Station and Canals sections of the game. Check them out here. CRASH FORT uploaded an impressive TAS of a surf map surf_lt_omnific for CSS, using his own Source Tool Assist plugin for SourceMod. Chinese_soup found a way to skip Blast Pit using the new Save Warping glitch for the scripted category of Half-Life 1. We have just finished the Half-Life: Source speedrun that we’ve been working on for a while now. The speedrun came out surprisingly short – it even beats the legendary Half-Life in 21 minutes speedrun! Yes, that’s correct! The final time for this Half-Life: Source speedrun is just 13 minutes and 16 seconds! Although it’s not really fair to compare the GoldSrc and Source versions of the game, we could’ve never imagined a Half-Life: Source speedrun to ever compete with Half-Life 1, especially back when there were attempts to make a speedrun of this game around 6 years ago. The speedrun will premiere live this Saturday on October 15th, 6PM UTC at http://twitch.tv/SourceRuns! The runners will also be doing a live commentary after the run, so don’t miss it! UPDATE 08/14: The SourceRuns Marathon 2016 is now over! Over the two days we’ve managed to raise $621 for the National Alliance of Mental Illness, which is almost 2.5x more than our original goal of $250! Thank you for tuning in and for your donations, we hope you enjoyed the show! Look out for a list of highlighted marathon runs in the forums! UPDATE 08/10: Schedule is finalized, and we’re ready to go! The marathon will start at 15:00 UTC and will be streamed on our Twitch.tv and YouTube channels. Don’t miss it! UPDATE 08/03: Submissions are now closed. The official dates for the marathon are August 12th and 13th. Schedule is being worked on. It’s that time again, time for another SourceRuns marathon! This year will be the second annual marathon hosted on http://twitch.tv/SourceRuns where Source and GoldSrc speedunners will livestream runs of their game of choice as fast as possible in front of a live audience. The marathon is currently in the planning stage, so we don’t have an official date yet, but it will most likely be sometime after ESA. In the meantime, all speedrunners are welcome to sign up here! We accept all games based on the GoldSrc and Source engines, as well as all of their mods! It’s a good opportunity to show off your skills in that one mod you wished got more attention within the speedrunning scene. Submissions will be open for a week until July 21st two weeks until July 28th. After that, we will pick the most suitable date for all runners and start building the marathon schedule. A follow-up post will go live after the deadline with more details (dates, schedule and so), so stay tuned for that! If you have any questions, feel free to ask them in the forums thread. Hey! This is our second community round-up post. In the first one we promised to do these bi-monthly, but since we’ve been very busy (releasing HL2DQer and stuff), we had to delay it until now. A lot of things have happened since then, but we’ll try to cover them anyway! There have been some overall rule changes for the leaderboards of most GoldSrc games. As a result, “wait” command is now banned in scriptless runs, a PS2 Category was added for Half-Life, and runs with different difficulties (WON Hard and WON Easy) were merged to a single category (WON). A major, GAME BREAKING glitch, called “Save Warping” has been discovered by Rama on GoldSrc and Source games with triggerdelaying. BitRain has made a video explaining it here. Another good example of the glitch is this particular run of Half-Life’s Hazard Course by YaLTeR. Half-Life 2 Done Quicker is out! The run premiered on May 1st on the Games Done Quick twitch channel, following with a brief commentary about the run. Portal speedrun done with least portals is out! Jukspa, Noir, Blizik, Elgu, Icykittenz, Fnzzy and Xeiz complete the entire game with only 15 portals in 13:47! Bloodvez has uploaded a segmented speedrun of the well-known Half-Life modification They Hunger: Episode 2, beating it in just 8:48. Check it out! Jukspa has made an impressive TAS of Half-Life 2’s coast levels! If you wish to know what happened in this run, Jukspa has also uploaded a commentary explaining it. Rama has also made a TAS of d2_coast_08, a level that is usually skipped in speedruns. This run follows the SourceRuns Winter Contest rules for this map, which means that getting up on top of the bridge is not allowed. Quadrazid uploaded a short “TAS experiment” of Opposing Force chapter “Pit Worm’s Nest”. YaLTeR has uploaded a TAS of Half-Life’s Anomalous Materials chapter. Since this is a part of the Half-Life full game TAS project, it’s using the sv_airaccelerate 100 setting. BitRain has made a TAS of Half-Life 2’s cut level “Lost Coast”, beating it in just 6 seconds. Counter-Strike: Condition Zero Deleted Scenes – Miami Heat Individual Level speedrun by coolkid. Congratulations to nin_talal for getting the Half-Life scriptless World Record in the time of 32:49! A short speedrun of a Half-Life 2 level “Verizontal” by Elgu, beating it in 35 seconds! Two speedruns of Half-Life: Source have been started! Why two, you might ask? One of them is following the traditional approach, while the other is using the newly discovered Save Warping glitch. Half-Life 2: Episode One Done Quicker has been restarted once again, and is slowly progressing, currently at ep1_c17_00. Follow the progress at the timesheet. PJC has made a video explaining everything you need to know about game versions in GoldSrc speedrunning. executλble has uploaded a short video showcasing a small timesaver in Opposing Force’s of1a2 level. Half-Life 2: Done Quicker Outtakes have been edited and uploaded by BitRain. Rama has uploaded an unfinished TAS of the Ravenholm chapter from Half-Life 2. Check it out! Hey everyone! We had an idea of making these bi-monthly community round-ups here in order to let you guys know what’s going on around the community and keep you updated. After a long discussion and some voting on our Discord server, we’ve formed a new category for the Half-Life and Opposing Force leaderboards at speedrun.com. From now on you’ll be able to submit runs that use scripts! More details can be found in the categories’ rules. SourceRuns now has a couple of game servers that you can play on. The first one is a Counter-Strike: Global Offensive server running KZTimer and kz_ maps. The other one is for a Half-Life mod Adrenaline Gamer. Both of these servers are located in Strasbourg, France. A LiveSplit Auto-Splitter has been released for Half-Life, Opposing Force, Blue Shift and Gunman Chronicles. This allows for automatic timer starting & stopping on game ending, as well as automatic splitting on every game chapter and level. For setup instructions, read the guide here. Half-Life 2: DWaHMoV has reached 1,000,000 views on YouTube! Wooo! Congratulations to chili_n_such on getting the World Record for Half-Life 2 with the time of 1:21:21.990! Congratulations to PJC on getting the World Record for Half-Life: Opposing Force in the Single-Segment category with the time of 24:38.880! Congratulations to Jukspa on getting the World Record for Half-Life 2: Episode Two in the Single-Segment category with the time of 50:12.370! Rama has uploaded a speedrun of a Half-Life 2: Episode Two mod Tr1p, beating it in the time of 5:26. Half-Life 2 Done Quick-er is nearing it’s completion, currently being at d3_breen_01. However, there’s still video production work left. Imanex has uploaded a video Portal – Watch Your Step, a runthrough of Portal with least in-game steps taken to beat the entire game! PJC has made a Half-Life: Blue Shift speedrun tutorial which should be helpful if you want to start running the expansion. Bloodvez has been researching a bunch of strats for Sven Co-op and has uploaded a video showcasing a lot of major level/chapter skips. Jukspa has uploaded a tutorial for the Half-Life 2: Episode Two Dog Race skip. Tryedz has made a Half-Life recent strats video, showcasing and explaining all the recent strategies/tricks used in SS/RTA runs. Oh hey! This looks new, doesn’t it? Welcome to our new website! It’s something we’ve been working for a while. As the name implies, it’s still in beta, and there’s a lot of things that need to be done until it’s complete, but we’ve decided to go live with it anyway. If you dislike the change and/or just prefer the old site, it’s still available over here for the time being. Feel free to look around. As you can see, a lot of planned content is still missing, the site loads pretty slow (will be way better later on) and some of the features we want to add are still on their way. Check our to-do list below. The forums will remain at the same place, but an interface overhaul is planned soon too. ..and whatever we come up with later..
As you might have heard there has been quite a bit of discussion about the rules for speedrunning Half-Life 2 and the episodes. This led to numerous arguments which didn’t end up in any sort of consensus, so to solve these issues we held a poll about various things between the people who have done RTA runs in the past 6 months. The games that are affected are HL2 New Engine, HL2 Old Engine, HL2:EP1 and HL2:EP2. We’re going to go through a transition period of two weeks after which these rules will go into effect on the speedrun.com leaderboards. If you know any active runners who are using the leaderboards then please let them know. Menuing and pauses are counted towards the final time. As of right now the Livesplit timer doesn’t automatically count these in so you will have to time these manually from the video and add that to the Livesplit game time if you want to submit a loadless time.Just upgrade to Livesplit 1.6 and the menus should be timed automatically! No manual timing needed. You can no longer use modifications to your HUD that give you some sort of an advantage. The most common of these was disabling the white flashing while taking damage, which is no longer allowed. Modifications that clearly give you no benefit at all, like changing the font or altering the credits text are allowed. You can no longer use maps from different versions. Most commonly this was being used in HL2 for using steampipe maps in the new engine unpack. So if you are using the Ghosting Mod or the Source Unpack you’re going to have to update your maps. Here’s a link to download the maps, optionally you can also get the newest version of the unpack as that has this issue fixed. To update your maps just copy and paste the map files to your maps folder. What hasn’t been decided yet is what effect this will have on the runs that are currently on the leaderboards, so if you have any thoughts on that or any questions on the specifics of the rules then feel free to post in this thread. Update: Jul 22, The SourceRuns Marathon is now over! Thanks to all the runners and to everyone who watched the marathon, it was a really great experience! A list with all the speedrun videos done during the marathon can be found here. After some silence, we finally have more news on the GoldSRC/Source speedrunning marathon that we announced earlier on June. This marathon, which we’re planning to place between the end of ESA (July 5) and the start of SGDQ (July 26), will be a mass-collection of speedruns of all of your favorite (gold)source games, by all your favorite SourceRunners. There will be no donations since this marathon is purely for fun. We’ve finally finished taking submissions and planning the schedule for the event! The SourceRuns Marathon will take place on July 20th, starting at 3:00PM UTC and will be running till July 21st! Huge thanks to all the runners who submitted the games for the event. Some minor changes are possible in case a runner isn’t available or we’re ahead of the schedule and need some filler content. The whole marathon will be streamed on the SourceRuns Twitch channel. So if you would like, you can follow that for updates! Recently, we’ve been interviewed by the Valve community news site LambdaGeneration on the Half-Life 2: Episode Two Done Quick speedrun we’ve done just a few weeks ago. In the interview, we talk about some general speedrun-related stuff, background info on the run creation process and a few other things. Development of the run started immediately after SourceRuns released Episode One speedrun back in 2010, a small group of runners started routing Episode Two’s maps and eventually doing segments. The run has been in progress for a very long time, lots of game-breaking tricks were discovered that forced the run to be restarted 3 times until being finally finished, saving more than 6 minutes from previous time estimates. The SourceRuns Winter contest is now over! The SourceRuns Winter contest has now ended! The fastest time of the last map, surf_river_of_flame, has been achieved by sadf – 34 seconds! It’s been really great seeing the community submit so many demos for our event, some of the objectives were easy, some were hard, but we were mostly impressed by the amount and the quality of your submitted demos! 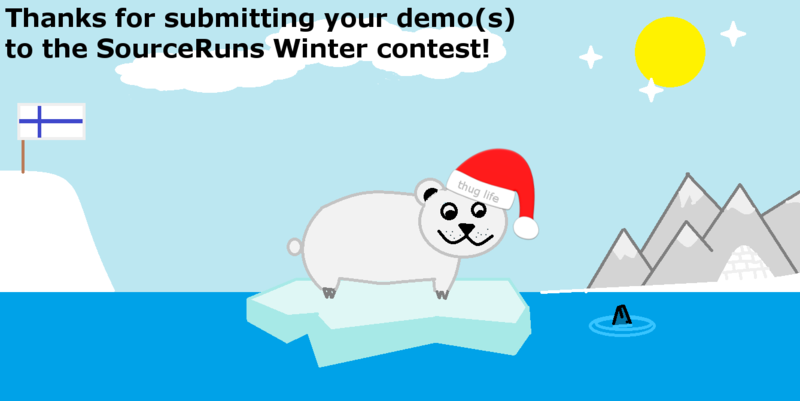 Starting December 10th up until December 26th, runners have been submitting their fast demos of our selected maps and the runners who collected the most points at the end of the contest have won. Grand prize: Humble Indie Bundle 13 BTA. 2nd place gets GRID™ + Half Minute Hero: Super Mega Neo Climax Ultimate Boy + Blackguards. 3rd place will be awarded with Always Sometimes Monsters + Full Mojo Rampage. Congratulations! Detailed leaderboard can be found here. A video compilation of the fastest runs can be found here! We also want to give a big thanks to everyone who participated. Here’s the special prize for you – a drawing of a polar bear by Elgu & exec! We hope you enjoyed this contest, we’re looking forward to do more of these in the future! So, today I wanted to make an important (unrelated to us in anyway due to its age) announcement that we have wanted to talk about for some time, but felt our reputation would be harmed or cause an unnecessary backlash from previous runners. First off, I want to express my gratitude to the runners of HL2DQ. Their hard work and dedication has brought our community together, and without it, we wouldn’t be where we are today, with 12,000 total forum posts, 10,000 subscribers and 1.7 million views on youtube, and over 300 members on our forums. We really can’t thank you guys enough. However, this does not include the runner, bandit5k. Back in 2009, the new SourceRuns team discovered that HL2DQ was a cheated run, and should not count for any world record. This discovery is partially the reason DWaHMoV was made. Bandit5k, responsible for 13 segments throughout the run, decided he would take it upon himself to use both timescale, which is very clear in the Ravenholm segments, and, possibly, used different saves in some of the coast segments, which you can see when he has a different speed coming out of the tunnels. Because of his selfishness, he defiled what was an amazing achievement, and completely invalidated all of the runner’s hard work. I apologize tremendously to all the runners who participated in HL2DQ, especially DaleLewill, who has been extremely supportive of our community since we started. Bandit5k has since tried making a comeback to speedrunning, as he joined the hype with Portal 2’s release back in 2011. Inexistence, TYPICAL, and I had to monitor his activity to make sure he would not ruin yet another run. If anyone sees this person trying to participate in any speedrun-related project, please inform the run’s head. We do not stand for nor tolerate this kind of dishonesty, and we feel responsible for making this aware, as it does reflect on our community. Here at SourceRuns, as you might already know, we’ve started taking speedrun submissions. Almost three weeks later, we’ve finally got our first submission – a segmented speedrun of a Half-Life 2: Episode Two mod “Person of Interest”, beaten in 2:23 by Rama! Congratulations! Done in 54 segments, this run is a lot more than you’d expect! Tons of ABH launches, damage boosts and even going Out of Bounds! Enjoy, and keep submitting your runs! The moment we’ve all been waiting for. Half-Life speedrun in 21 minutes is finally out! What are you waiting for? Go watch it now! In-depth video commentary is coming soon, so stay tuned for that. For those who are unfamiliar with HL21 – this is a speedrun of Half-Life 1 that Spider-Waffle and quadrazid began planning in mid-2010. At that time it was estimated to be 27 minutes long. The speedrun finally entered the running stage on the summer of 2012 with a time estimate of 24 minutes. Many skillful runners have joined to create the ultimate Half-Life speedrun. During the running process, new tricks and routes have been discovered, dropping the estimated time down to 21 minutes. And here it is! Half-Life in 899 jumps, 317 segments, 20 minutes and 41 seconds.